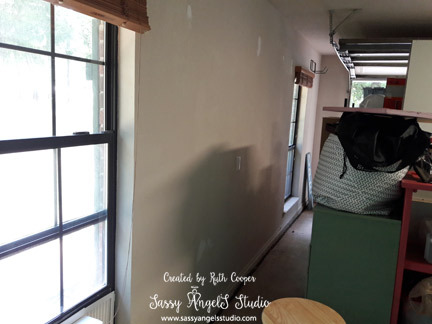 Studio Makeover Part 1 – Welcome! The bumps continued after we moved in. 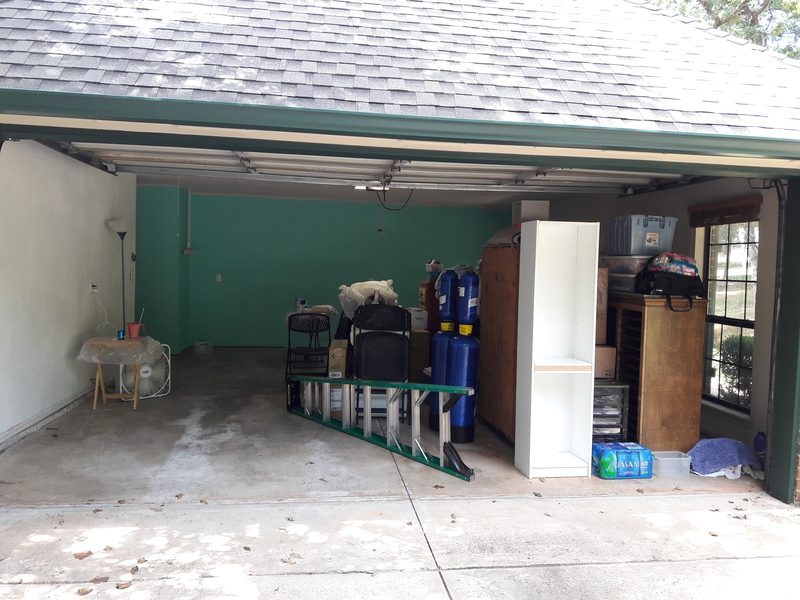 We were hoping to put most of the stuff that didn’t have to be unpacked immediately into the 30 x 40 foot shop on the property & stage it into the house. Well the shop was infested with black & red wasps & hornets. So everything either went into our tiniest bedroom inside the house, it is currently packed floor to ceiling, or into the garage that is becoming my studio. So I was delayed from starting on the studio until we could unpack some & organize more. We actually held Angel Club by email/text/Facebook messaging last month. Progress has been slow but steady & we were finally able to start working on the studio a couple of weeks ago. 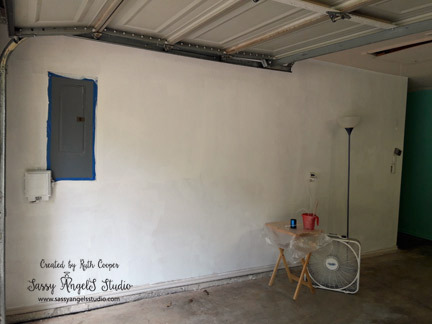 Here is an overview of the soon to be Sassy AngelS Studio with the garage door open. (We are parking our cars in the now wasp/hornet free shop.) The back left corner will host the new whole house filtration system & the baby deep freezer. The nearly 470 remaining square feet will be studio space. Most of the furniture you see to one side is part of the studio furniture waiting to be placed in its final location. Before we got to this point, the garage floor was scrubbed, the flourescent light was replaced with a new LED fixture, the water softener (which didn’t work right) was removed to make way for the new whole house filtration system (blue tanks in picture), old crummy shelves & peg board were removed from the back wall & the air conditioner was set up (so necessary in the Oklahoma heat). This step occurred about 2 weeks ago. The air conditioner still needs its final insulation & securing & it will be finished but it functions for now. So far nothing in the house is standard, so the guys had to improvise on a support shelf. It works great keeping the space cool & we’ll work on heating solutions in Sept/Oct as it cools down into fall. Fortunately the attic above the garage is spray foam insulated & the guys are going to add some extra loose insulation under the floor boards to help keep the studio more temperature controlled. Which brings us to the current progress on the studio. Last week my good friend Sue came to help & we got the walls scrubbed down & the first coats of paint on the back & left wall. 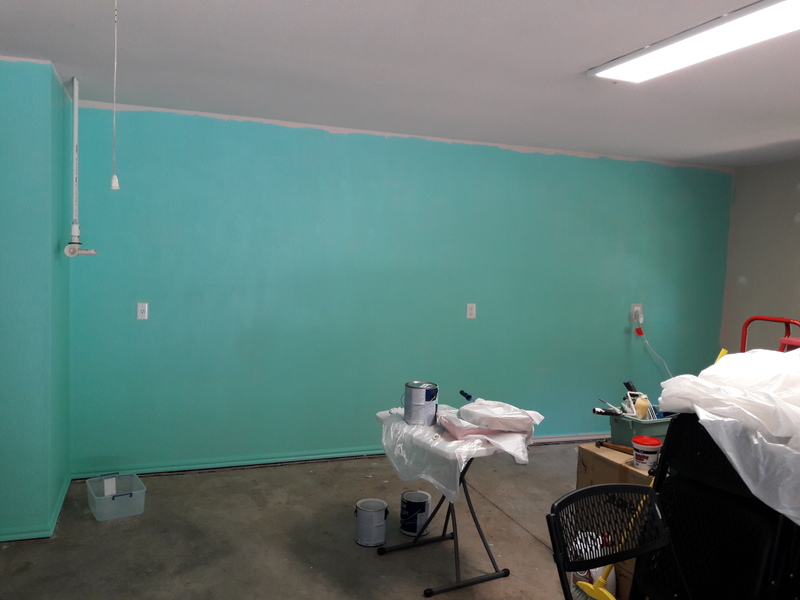 I got the second coat of Bali Hai Teal (an HGTV dream home color) on the North wall today. So here are the remaining pictures. The pipes you see in the left corner are to hook up the filtration system & the freezer will go in that corner. To the far left is the entry into the house where the laundry room is & a large sink to wash up paintbrushes & stencils in. The remainder of the wall will eventually house my standing work station. It will hold my cutters & die cut machines. This is the West wall & after its 2nd coat of paint tomorrow will house my giant paper shelves. Still working on a camouflage for the electrical panel & the guys will remove the old phone box & we’ll flat cover it. This is a peek at the East wall around the studio furniture pile up. 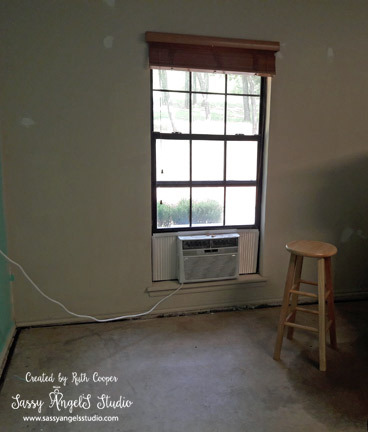 As you can see there are 2 nice size windows to let in natural light, one housing the air conditioner. Not quite sure what will go on this wall yet. The plug in the center of the wall is the access to the well pump electrical, so probably nothing heavy & tall. It still needs painted. 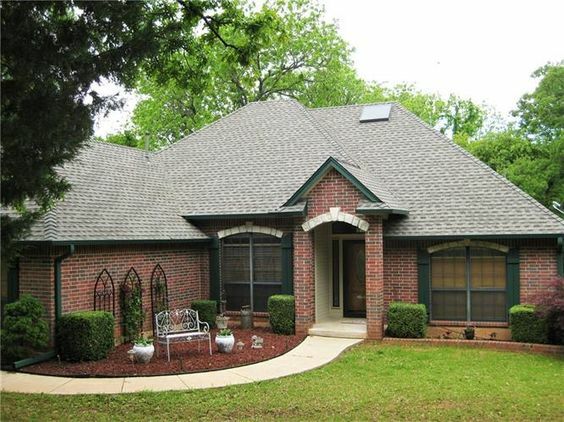 About 90% of the house was painted in a crappy peachy beige that has an awful yellowish tint in certain light. Yuck! Needless to say, the whole interior of the house will receive fresh paint over the next few months. My custom designed worktop & the classroom tables & chairs will be arranged in the middle of the space. This is high on my wish list for the studio. 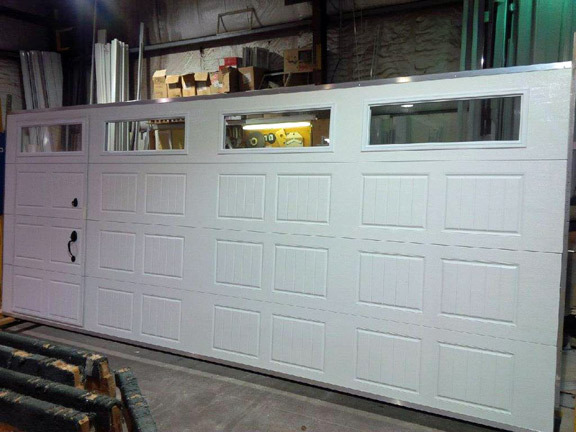 It’s a Walk-Thru garage door, fully insulated, additional windows & will give me a dedicated entrance to the studio & still functions as a regular garage door, so no permits from the city needed. We are still figuring out the logistics, it will take 4-6 weeks to get here after ordering & we have to find a local installer for it. On the schedule for the rest of this week is finishing the paint, laying the floor tiles (I’ll have to order more), setting the paper shelves into place & getting the tables & chairs up for club next Monday. It will be bare bones but I will be able to host club for the 1st time in the new studio. So excited! Hope you liked this sneak peek into the studio progress. I am working to update the class calendar & will have more studio updates as it takes shape. Make time to be creative this week! What a beautiful home! You all have been very busy; it is looking wonderful. How Exciting! It’s a lot of work, but isn’t it fun to plan and see everything come together. Looking forward to seeing your finished room! Thank you for sharing these pictures. I’m so excited to meet in your new studio!